The dialogue with nature is a spiritual need, through which one gets rid of his heavy burdens of life and which enables him to go beyond the materialistic. Our memories about nature scenes don�t include only pictures of skies and earth and whatever lies between them, but it includes first of all what our hearts feel towards these scenes, as each of them is bound to our very special fine feelings that�s what makes them portrayed in a sympathetic human condition that show technically a different spirit from one artist to the other. 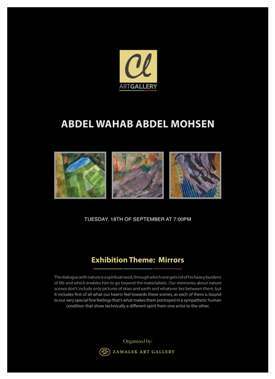 The Artist Abdel Wahab Abdel Mohsen displays in this exhibition a collection of works that provide a new look of the nature�s scene from a more up-to-date and innovative perspective, which moves him from his descriptive style to a very special spiritual situation maturing all his works, by providing a visual research about the nature�s manifestations spirit and conveys it to us using an intense expression of it. It is once more, the Lake Burullus, that wrote a new important chapter in this artist�s biography, where it was shown in his �Graphic� past experiences to show high professional and mastery skills of the artist as one of the biggest Egyptian Sculptors, where he - this time � leaves his capabilities behind and approaches us through a simpler technique which is more spontaneous and much closer for picking up the thread of this emotional, sweet and beloved instance, he is handling the lake this time. The Lake Burullus, is presented in this exhibition through works carried the criteria of the �difficult simplicity� using just a pencil and layers of transparent colored areas, where he starts using large areas of a transparent colors to build up a calm relaxing visual structure for the place whereas the lines started to rush following each other, in various directions weaving a linear structure of the figure, precipitating on its first color structure, where their convergence results in unexpected effects in the areas of light and shadow, that are not used by the artist for materializing or relieving, but he just expanded the colors on his canvas giving a wavy impression to the watchers eyes, the scattered spots of color lines spread like rain drops or lake water moved by the breeze from its tranquility. The multiple adjacent small dashed lines are forming a woven net, drawing the lake�s surface that is moved by the wind causing chills of live souls that was still alive, this sense that the urban is missing with distinction. The artist looks to the lake area staring from the inside to achieve closer contact with it. He draws from the heart of the place: wild grass, irregular plants and water movement by the wind and the moon reflected on the crystal clear lake surface. This approach makes us feel that we are in the heart of the lake, which lends intimate reception in the scene and of course, Abdel Wahab didn�t put a work plan for this canvas but the trying to interpret visually extrapolate it may lead us to exploring the artist�s work steps. Abdel Wahab�s works are filled with life and vibrant saturated pulse rhythm of nature, which made us sense it through the successive dashed lines which gives a woven look to the picture as if they were signs for heart beats or like a pulses disciplined on the pace of life. He makes a magic emptiness or a parallel nature, a nature, with no trace of human beings, who became a nature fighter and damager. Therefore the artist took him out of the scene. The artist misses the reality of abstraction, while he provides us with scenes of nature; it belongs to abstract rather than to reality. The artist immersed the scenes in a drama light and sometimes in quite ambiance and some other times in a lonely atmosphere. He has drawn it from an overhead point of view, but close to the area of the scene indulged him and became part of it and led us to look from the same angle and so we became inside the scene not outside it as familiar in the drawn scenes of nature. Abdel Wahab�s scenes remind us of dramatic scenes of artist Turner�s the four elements: earth, air, water and fire in their relationship with the nature�s elements in terms of its article (substance) dissolve and turn to sensory impression lending to abstraction. The artist presents a state of identification with the flat area through a Sufi rhythm, regularly frequently repeated lines and the spread color spots and color touches, where he goes a long way to come closer to the universe rhythm, reminding us that we all belong to the biggest ever and most glorified and unlimited. This way we can escape from the vortex of modern life, which tries swallowing us and suppressing the humanity in us. The artist got engaged � in a way or another- in the context of constructive movement aiming post radiance and elegance to nature. Since the beginning of an awareness of man, he is always trying to connect the elements of nature details with its implications on the meaning of life and cosmic harmony, which links people in the system of cosmic dialectical relationship as a whole. The artist scenes remind us of the perception of the Hindu faith, which is based on looking at the universe as a dream where creatures are scattered on its surface, such as rivers scattering on the ground, before drying up and dissipating in the eternal darkness. This movement and its continuous variations against the eternal nature is all what Hindu art aspired to express. However man in the modern era has seen the universe as an observer and separated himself from the world around him; the universe is no longer a gown wrapping it, but a scene that it is observing and accordingly went out of it and therefore went also out of the scene. Few artists who reconsidered the nature scenes to identify with them as the largest presentation of this manifested universe, one of those is the artist Abdel Wahab Abdel Mohsen.